Walk by your employees’ desks and see them surfing the internet? The bad news: They’re not researching how to improve the company’s results. They’re playing fantasy football or shopping for shoes. The good news: You can incent performance and raise morale. And you don’t have to spend any money. When turnover is low, employees still quit – they just don’t leave the building. 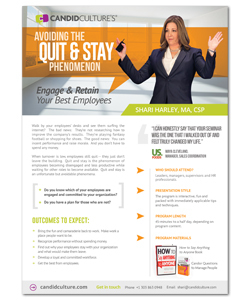 Quit and stay is the phenomenon of employees becoming disengaged and less productive while waiting for other roles to become available. Quit and stay is an unfortunate but avoidable phenomena. Do you know which of your employees are engaged and committed to your organization? Do you have a plan for those who are not? Bring the fun and camaraderie back to work. Make work a place people want to be. Recognize performance without spending money. Find out why your employees stay with your organization and what would make them leave. Develop a loyal and committed workforce. Get the best from employees. 45-minutes to a full day, depending on scope of corporate training and development. The program is interactive, fun, relevant and packed with immediately applicable tips and techniques. Leaders, managers, supervisors and HR professionals.